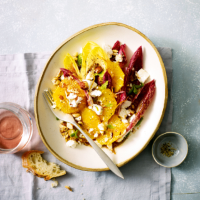 The sweetness of the oranges, slightly bitter chicory leaves and salty goat’s cheese make a perfect flavour combination in this winter salad. 1 Grate the zest and squeeze the juice from one of the oranges. Whisk together with the oil, cinnamon and mustard to make a dressing. 2 Cut away all the skin and pith from the remaining oranges and slice each one horizontally into rounds. a platter, and drizzle over the dressing. Scatter with the hazelnuts and mint, and serve with crusty bread. This recipe was first published in Tue Jan 12 16:21:59 GMT 2016.